The United States Postal Service (USPS) has specific requirements when it comes to mailing packages. While it's fun to be creative with the design of the package, there are some things you need to keep in mind before decorating a package to mail. There can be nothing that might catch on the post office equipment, such as ribbons, according to the USPS website. In addition, the delivery and return addresses should not be obstructed from view. Using decorative paper to wrap your package may be the quickest and easiest way to decorate it before mailing. Any gift wrap will do, but choose sturdy, thick wrap if you want it to survive the trip without easily tearing. Write the address on plain white paper and tape it to the top of the package after you have wrapped it. This way, the address will show up easily against the colorful paper. Write a personal (but not too personal, as mail carriers will see it) message on the paper as a way to decorate the package. Use different colored markers for a more colorful effect. Choose one for each member of the family for added interest. Or decorate the package with favorite quotes, the lyrics from a song or a poem. Just make sure the words don't run into the address. Keep them well away from the delivery and return address areas. Stamps, stencils and stickers are fun and easy ways to decorate a package to mail. 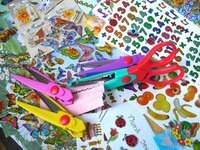 These are a good choice for young children, who usually enjoy stamping paper or playing with stickers. Stencils may be a little more difficult for young children. Use all three or pick just one item to focus on. For example, decorate an entire package with silver and gold star stickers. Or use a stamp in the shape of a dog bone to decorate the package and then add dog stickers.